You’ve seen the drawings of Beethoven: unsmiling, looking somewhat suspicious of the world, hair that looks as though it has endured many years of mismanagement and finger-combing. He doesn’t really look like a happy man. His visage is just short of a scowl. This is the familiar Beethoven, but last Sunday (April 15, 2018) at the Orion String Quartet concert, there was a different Beethoven. I caught a glimpse of him, perched on the organ bench – and he was – wait for it – smiling. He was pleased at what he heard; he liked what the gentlemen of Orion had done with his String Quartet No. 14. Okay, he didn’t actually slap his knee, but he did tap his foot. Really. I’m reasonably certain that Sebastian Currier and Anton Dvořák were also enjoying this concert, perhaps perched on the crossbeams of this beautiful old church. Why is it that some groups do a perfectly workmanlike job of playing these wonderful musical compositions and others bring a special quality that goes beyond mere artistry to a profound understanding of the work and the ability to express the composer’s notes allowing the audience to rejoice with them? Well, that’s Orion. Thirty years together this group, so they communicate with one another on the level of performance DNA. They take their name from Greek mythology. Orion the Hunter, Orion the Warrior, Orion which can be seen from almost any point on earth. The Quartet is cutting-edge in its interpretation of contemporary works (therefore, the sword) and muscular in its interpretation of the classics. The four gentlemen of Orion have been visible and praised in every corner of the world and their reputation gleams and glitters in the musical firmament. Besides performers, they are also teachers, generously passing their skills to a new generation of violinists, violists, cellists and string quartets. 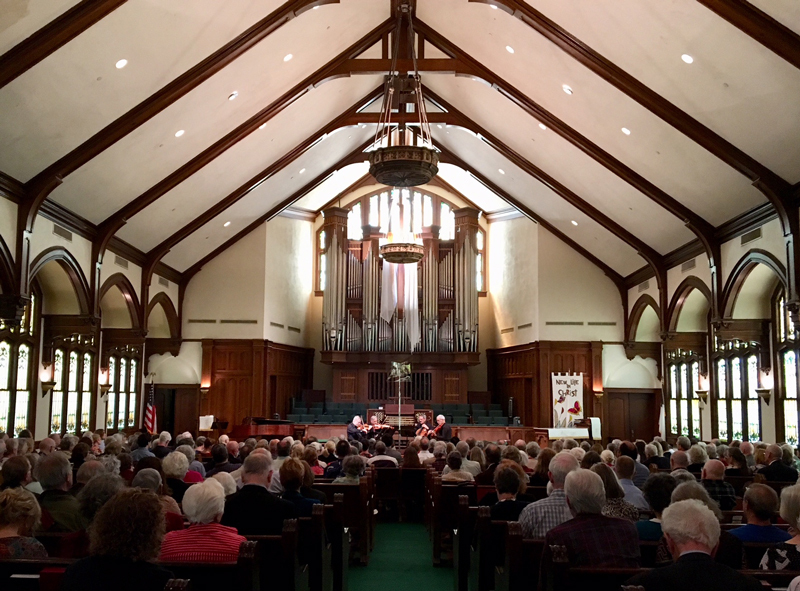 We of the San Antonio Chamber Music Society are thankful that their light shone on us for one memorable Sunday afternoon and I am perfectly certain that Beethoven, Currier and Dvořák enjoyed the music, too! And while we’re talking enjoying music, have a look at next season, the 76th. You will find music to enjoy, but only if you subscribe. The cost is the same, students and active duty military are still admitted free and I am certain that you will find some smile-worthy Sunday entertainment.